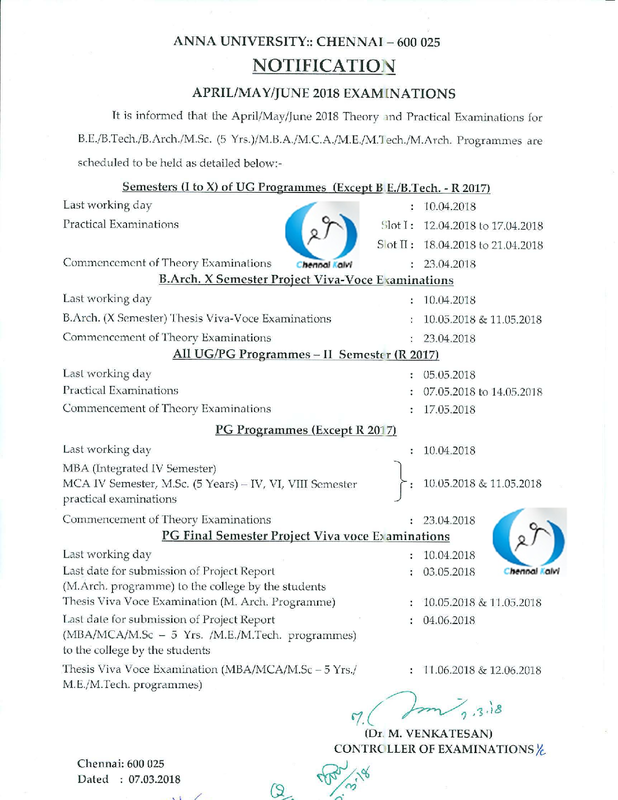 It is informed that the theory examination Scheduled on 22.11.2018, 23.11.2018 and 24.11.2018 of Nov/Dec 2018 Exams of AU pertaining to all Affiliated college for the UG & PG Degree Programmes for Thiruvarur, Pudukkottai & Nagappattinam Districts are rescheduled due to Cyclone. 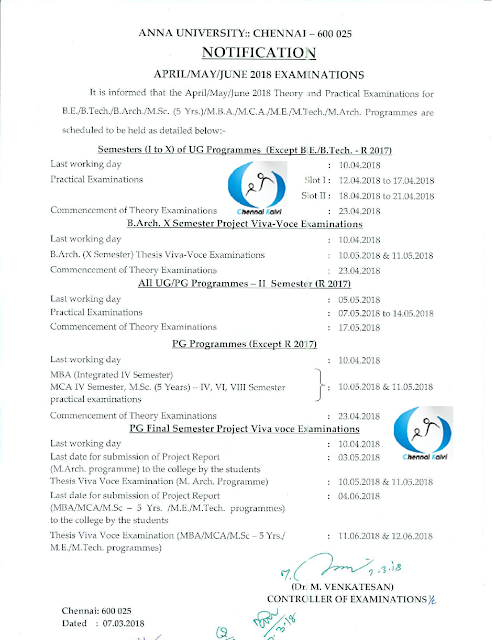 GAJA Effect : AU Exams scheduled on Tomorrow (24-11-2018) will not be conducted for the colleges located in Nagapattinam, Thiruvarur and Pudukkottai districts. The schedule for the postponed examinations for the colleges in the districts of Nagapattinam, Thiruvarur and Pudukkottai will be announced later. Exams scheduled on 24-11-2018 for All other Colleges will be conducted as per scheduled. GAJA Effect : AU Exams scheduled on 22-11-2018 and 23-11-2018 will not be conducted for the colleges located in Nagapattinam, Thiruvarur and Pudukkottai districts (College Codes: 8201, 8202, 8203, 8204, 8208, 8211, 8215, 8216, 8217, 8222, 8226, 8123, 8128, 8144, 8302, 9103, 9109, 9112, 9114, 9116, 9117, 9124 and 9126). Exams scheduled on 22-11-2018 and 23-11-2018 for All other Colleges will be conducted as per scheduled. All Anna University Affiliated Colleges Exams scheduled on 20-11-2018 are postponed to 17-12-2018. All Anna University Affiliated Colleges Exams scheduled on 19-11-2018 are postponed to 15-12-2018. All Anna University Affiliated Colleges Exams scheduled on 15-11-2018 are postponed to 22-11-2018. All Anna University Exams scheduled on 16-11-2018 for the Affiliated Colleges are postponed to 13-12-2018. All Anna University Exams scheduled on 17-11-2018 for the affiliated colleges are postponed to 14-12-2018. List of PG / UG Rank Holders 2018 is Published. ANNA University Published the List of UG /PG Rank holders of its (Non Autonomous) Affiliated Engineering Colleges. Note : Anna University awarding the ranks based on some rules. Anna University UG PG Revaluation Result - April May 2018 Result Published. Anna University UG/PG - April May 2018 Revaluation Result Published. Anna University Final Year All Semester - April May 2018 Result Published. 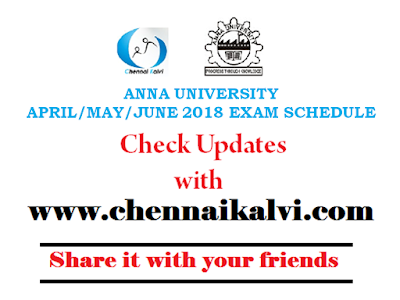 Anna University April May 2018 FINAL SEM Results Published. Madras University Results 2018 - University of Madras is going to declare April 2018 Semester Exam results today on their official website. Aspirants can check Madras University Results 2018 Online with chennaikalvi.com. It is expected that Madras University Results April 2018 will be declared on official website - results.unom.ac.in. Students can check their results online by entering their Exam registration Number. 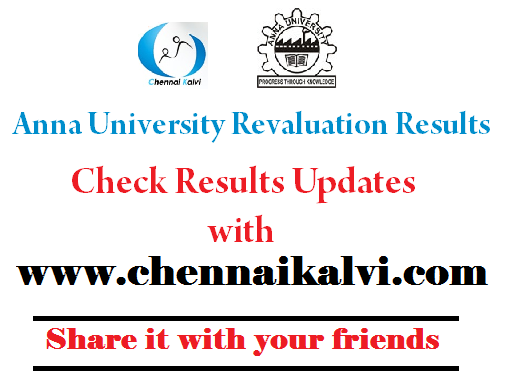 Chennaikalvi.com Provides notification regarding Madras University results date, Madras University revaluation results April 2018 date, Last date to apply for revaluation and other information. Candidates who have appeared for April 2018 Semester UG PG Degree Examination will get their results today. Choose UG/PG Professional degree course for which you have appeared. Enter the Exam Registration Number and click on the submit button. you can see the results displayed on your screen. Note: Kindly be patience to check Madras University Results as it may get slow due to heavy traffic. Please use the mirror server as well to check your results instantly. Generally University Provides a week time to apply for Revaluation from the date of results announcement. Hence, Tentative last date to apply for UNOM revaluation results April 2018 is 4th July 2018. Anna University Published UG/PG Time Table for August - 2018 Special Examinations. List of PG / UG Rank Holders 2017 is Published. The List can be download from here. Anna University has announced the Academic Performance of all Affiliated Engineering Colleges Apr / May 2017 & Nov / Dec 2017 Examinations for helping the Engineering Aspirants to Choose the best colleges in the TNEACounseling 2018. 286 Colleges Scored Only less than 35% Pass Percentage (And 6 Colleges got Less Than 1% or ZERO Percentage Only). Anna University Published the Practical Examination Schedule for April / May / June 2018 (UG/PG) Examinations. 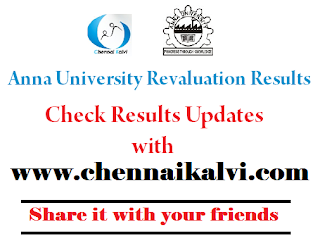 Check Anna University Revaluation results expected date information with chennaikalvi.com. The controller of Examination will declare the Anna University Revaluation results date for Nov Dec 2017 in coe1.annauniv.edu and also in aucoe.annauniv.edu. 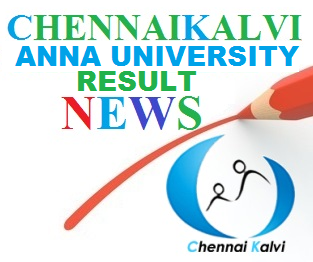 Anna University Nov/Dec 2017 revaluation results (Phase I) announced today. Check using below link. Anna University Nov/Dec 2017 revaluation results (Phase II) announced today. Check using below link. Anna University Nov/Dec 2017 revaluation results (Phase III) announced today. Check using below link. Anna University - Nov/Dec 2017 Results - First Semester - UG/PG Revaluation Result Published. Check using below link. Note: Above mentioned date may tend to change according to the COE Decision. Official information regarding Anna University Nov Dec 2017 Revaluation Results will be updated in coe1.annauniv.edu and also on aucoe.annauniv.edu.